Find Leads by Using Filters · You Don't Need a CRM! Finding the information you are looking for can’t take too long – sales reps are busy people. The information has to be easily accessible. Of course you can use the search engine, but if you’re looking for a number of lead in a certain category (such as a specific city, and still active), you will need filters. Inside no CRM.io it’s really easy to find this information. On the right side bar you can choose the filter that corresponds to the city for example, and then the filter that corresponds to the desired status, active. Filters work on steps and tags which is why it's very important that you personalize your sales steps, as well as create categories with predefined tags. 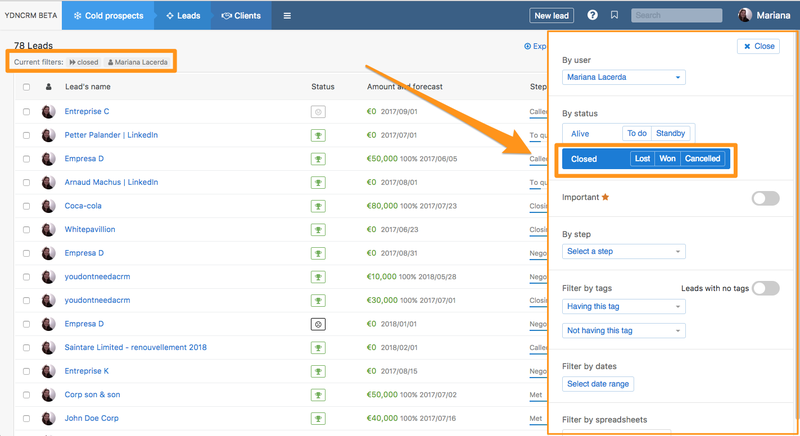 At the bottom of the screen, under the leads list, there's an export button that enables you to export all the leads that match the filter you have selected. It's very useful for emailing campaigns for example.